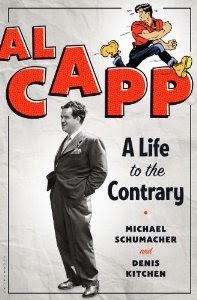 I’ve mentioned in prior posts that the increased mainstream interest in comics has led to an explosion of serious, in-depth biographies and documentaries focused on cartoonists like Hergé (Tintin), Charles Schulz (Peanuts), Will Eisner (The Spirit), Milton Caniff (Terry and the Pirates and Steve Canyon), and Alex Toth. Though now partly obscured by the passage of time, at his peak, Capp was a media celebrity, partly because, like many of the most successful of newspaper cartoonists, he was a master self-promoter. 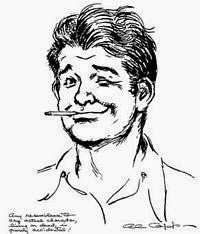 He was among the first cartoonists to become wealthy merchandising his characters and he successfully leveraged his syndicated comic strip into other media, including a still-staged Broadway musical based on his comic strip. Capp himself was a popular public speaker and often appeared on television, including the Tonight Show. Even if you never heard of Capp or aren’t familiar with his work, many of the characters and settings that sprang from his imagination—L’il Abner, Daisy Mae, Pappy and Mammy Yokum, the town of Dogpatch—have become part of iconic mainstream American lore. 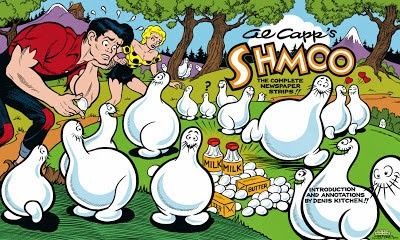 His strip also gave us Sadie Hawkins Day and the Shmoo. Capp also had a legendary dark, misanthropic and curmudgeonly streak that ultimately proved to be his undoing, which has somewhat cast a shadow over his achievements. To partly understand the man is to know that Capp lost one of his legs in a trolley accident at the age of 9. While the ambitious Capp early on refused to let it define him, his very determination to do so no doubt colored much of his personality. To his credit, this made Capp, to a degree, a model and advocate for people with disabilities. The book movingly tells of his work in reaching out to amputees, especially children, to assure them that they could continue to have normal, successful lives. During World War II, he produced a comic-strip pamphlet for war amputees that drew on his own personal experience. Capp came from a home with an absentee salesman for a father and a mother who doted on him but always struggled to make ends meet. Due to his father’s absence, Capp was forced to be the “man of the house” at an early age, but he also had a streak of independence and rebellion. As a youth, he hitchhiked across much of the country and soon realized that his artistic talent was his ticket to fame and fortune. 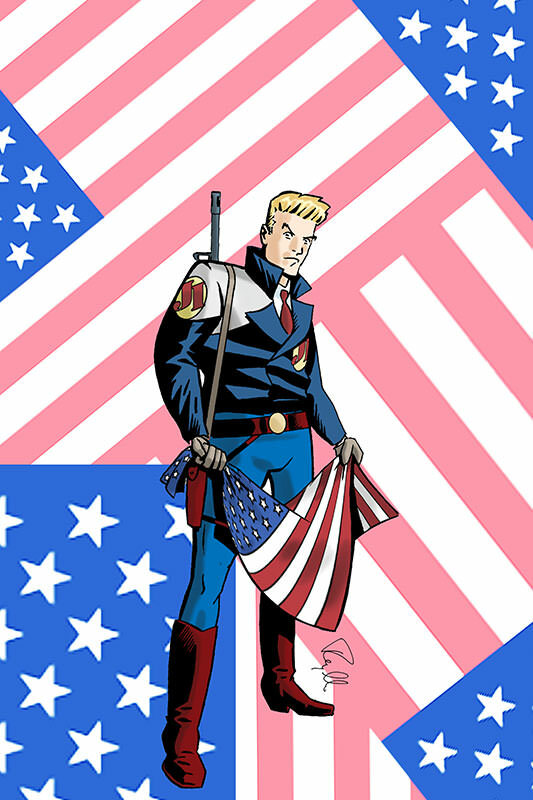 Best known is his legendary bitter feud with fellow cartoonist Ham Fisher, creator of Palooka Joe, for whom Capp once worked as an assistant. 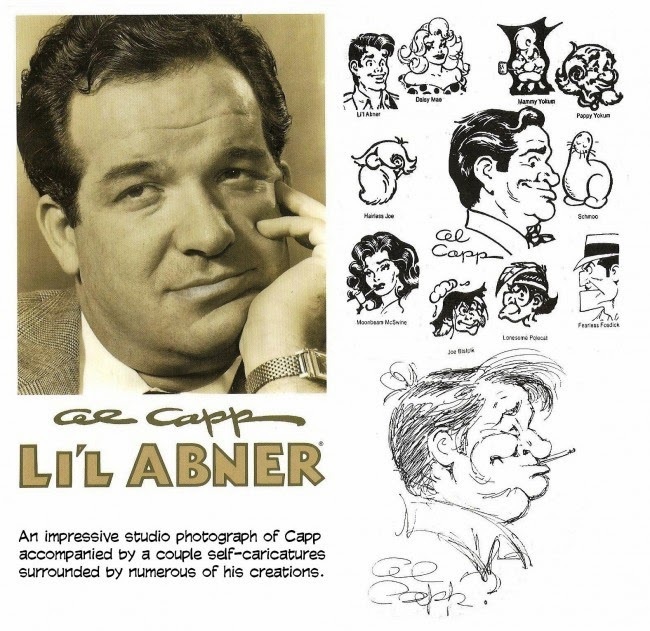 Capp chafed at Fisher’s claims that the concept of L’il Abner originated in his strip, while Fisher resented the success of his once assistant. The feud became very nasty, with Fisher accusing Capp in court surreptitiously placing pornographic images in his comics; in turn, Capp taunted Fisher and turned his cartoonist peers against Fisher. The incident led to Fisher being humiliated and ostracized, and his eventual suicide. In the meantime, Capp’s complex relationships with his family and money also added to his problems. Though he genuinely loved his family and took seriously his obligations to support them once he attained a measure of affluence (including his siblings, who helped him with his business dealings, and his mother), he nevertheless still felt resentment and enormous pressure, which manifested itself in frequent feuds, health issues, and at one point, even a suicide threat. In addition to his serial affairs, Capp also had a longterm affair with an entertainer; though he and his wife considered divorce, Capp ultimately could never bring himself to end the marriage. While Capp left behind a legacy and an estate which continues to control his creations (he was one of the few cartoonists to gain ownership of his own characters in his lifetime), he nevertheless died a somewhat lonely, broken man, having been ill equipped to enjoy or handle the wealth and fame his cartooning brought him.